You must have seen the above picture or something similar plenty of times. And though it is not all true, there are many aspects of it that are close to reality. “In India people become engineers first and then figure out what to do with life”. Again, the statement is true to some extent. But what about those students who got into engineering for the love of it? You always thought of working with cutting edge technology and what you get to do is hardly anything close to it. 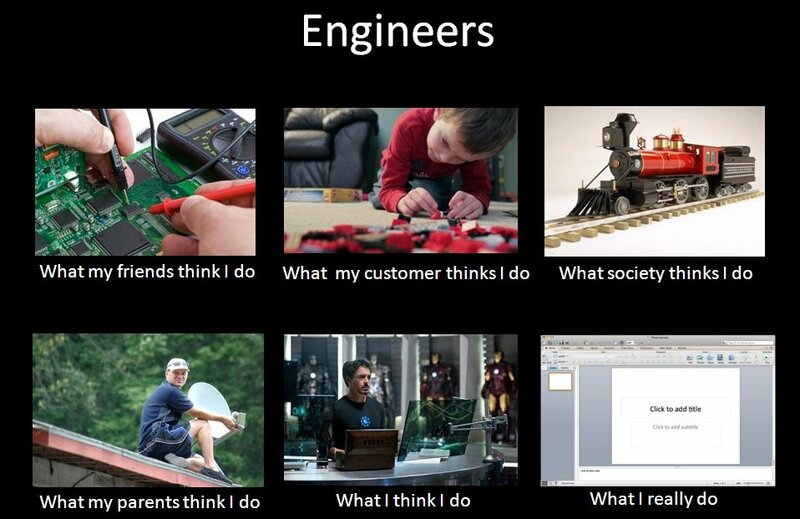 The cool and awesome devices that you thought you would create when you become an engineer remain just plans. What causes this gap? Is there a way to bridge it? Though education is supposed to be an evenly balanced process of theory and application, the college exams often test just the theory part. Most of the marks that we get are for what we write from our memory. Yes, there are those numerous equations and problems to be solved. But most of that is solved using the pen and paper. The real world demands more than that. The bridge between the theoretical aspects and real world is project based learning. However, in engineering curriculum, projects are for the final year students. And this lack of application of knowledge in the real world throughout the course of study is what hinders us from truly appreciating the things that we study. This is where hobby projects or doing a small project for a few of the subjects that have to be studied in a particular semester comes into the picture. Projects help us in understanding the subject better which in turn leads to remembering what we have studied for a longer duration of time. Do you remember all that stuff that you read for the exam you wrote a few months ago? Probably not. But you will definitely remember a lot of things if you have done a project on the subject. Projects encourage us to dig deeper & help us learn new things. Projects make learning more learner driven than teacher driven. And suppose there is a group of friends who are working on a project, think of the many ideas that can be thought of while working as a team. Brainstorming with like minded individuals offers new insights into the problems. There is a lot to gain for each of the team members if everybody works together. Doing more projects builds the problem solving skills. Projects are not just about making something new and fancy. It can be something very basic and simple or improvising on the existing things. Another thing, it is very likely that the projects don’t give the expected results the first time. This is where we learn another skill from projects- debugging. As important as it is to get things right, it is equally essential to make mistakes and then analyze where we might have gone wrong. And projects teach us just that. And the best part about doing projects is that they add value to your resume. You have a better chance of getting hired if you have done a lot of good projects. There may be a question in your mind about how to get started with projects. Start with small projects and gradually you can move to more complex ones. There are plenty of resources (including project ideas) on the internet for help on various types of projects. You can start with those and then move ahead and frame your own problem definitions for projects. Take help from your seniors when necessary. If the project that you want to do demands that you learn a new software or a new programming language, don’t hesitate to learn it. Projects help us become better learners and better engineers. I believe the same applies to other fields of study as well. The skills that we learn by doing projects make us better prepared for the industry. The main constraint is time and time management is a skill that projects teach us. It isn’t difficult to manage time to do projects if we plan properly. Ideal conditions and behaviour that we scribble in the papers rarely exist. So get ready for the real world and don’t hesitate to rack your brain and get your hands dirty and do some projects. About author : Reema Mishal D’souza is a B.E, 4th year (Electronics & Communication) student at B. V. Bhoomaraddi College of Engineering and Technology.